***NEW*** Stainless Steel 600ml bottles are now available! We have managed to source some excellent quality stainless steel bottles that are now available for order and customisation! Stainless steel offers greater durability and can also handle hot and cold beverages better than aluminium. The design is perfect – wide mouth for much easier cleaning, adding ice, coffee, rehydration solution, whatever you like! They also come with a very convenient sipper-cap for rehydration on the move! Available now! Our eco-friendly bottles are made of durable aluminium and come complete with a secure screw top and a stylish carabiner clip. The containers feature your choice of artwork, enabling them to play a key part in your branding, and can last for up to four years or more. 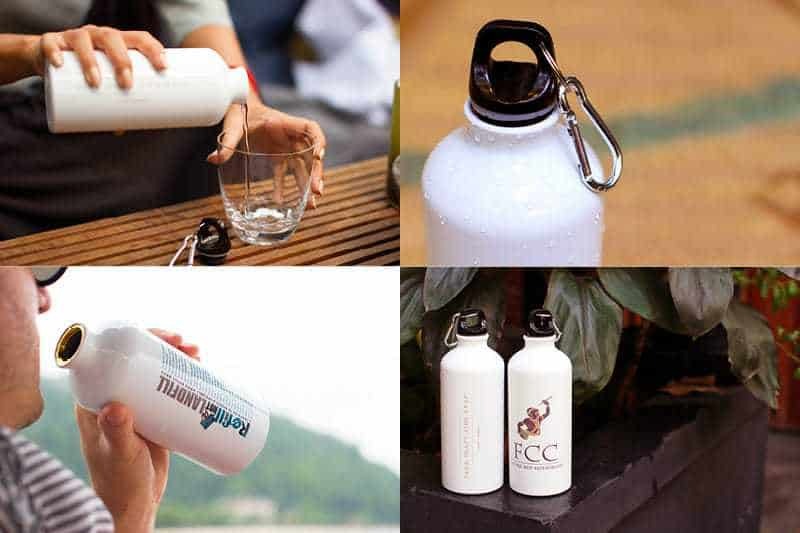 The back of the flasks – all supplied at a specially reduced rate by the experts at Coola Products – also feature a list of our free-of-charge refill stations, empowering users to top-up their water supply on the move. And because we know that each organisation is unique, Refill Not Landfill encourages our partners to distribute the bottles in the way that is best for them. That could be providing them to hotel guests or selling them as branded merchandise. A range of additional items, from mugs to bottle coolers and sports-style bottle tops, is also available. • Available in two sizes (600ml or 750ml). • Feature a secure screw top with a carabiner clip. • White or metal finish. • Branding of your choice. • SGS safety test approved (more details on request). • Bottles refillable for free at water stations nationwide. Please visit our ‘prices‘ section to learn more about the bottles, or contact us directly if you would like any further information about any of our products or merchandise.